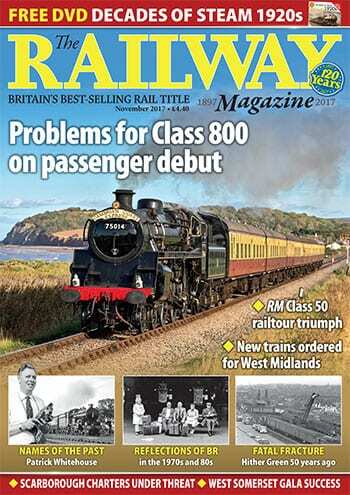 Bombardier and CAF to build new West Midlands trains, GWR Class 800 debut, HS2 could force closure of Toton depot, £48bn funding for Network Rail CP6, Siemens and Alstom to merge, RM Class 50 special hits 100mph, Community Rail founder wins lifetime achievement award. Blue ‘King’ for Paignton? Llangollen GWR 2-8-0 sold, ‘CanPac’ re-wheeled, gala success for West Somerset and Great Central, A1 Trust eyes ex-SDR depot building. ECML power supply upgraded for new trains, Forres station relocated, further blockades on Gospel Oak-Barking to complete electrification work. Hitachi rolls out first British-built Class 385s for ScotRail, Class 20s on RHTT, more Class 707s delivered, extra Class 221 formed from spare VT/XC vehicles. 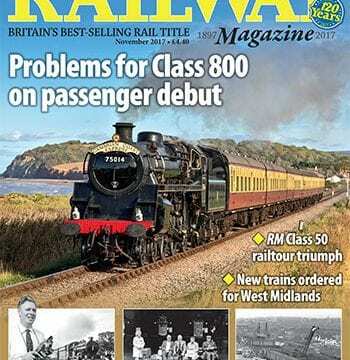 Subscribe today to receive your monthly copies of The Railway Magazine from only £20. Fraser Pithie looks back at the Hither Green derailment of November 5, 1967 and the maintenance failures that led to the death of 49 passengers. John Heaton shares his timing logs from October’s ‘Caledonian’ railtour to Glasgow, and compares them with a selection of historical runs. In the latest of his short biographies of well-known railway authors, Robert Humm tells the story of a famous photographer and preservation pioneer. An update on the Great Western Society’s project to build a replica Hawksworth ‘County’, and how you can help to complete the family of GWR 4-6-0s. A selection of wonderfully atmospheric and evocative scenes from northern England in the 1970s, captured by the camera of Andy Sparks. INSET: Railway Lives: P B Whitehouse. INSET: Evocative views of 1970s BR. INSET: Recalling the Hither Green disaster of 1967. December 2017 issue on sale Wednesday, December 6.